Our specialty awards make for memorable presentations. Many of them are constructed entirely in-house and offered no where else, such are our Pistol and Shotgun Gun Plaques. 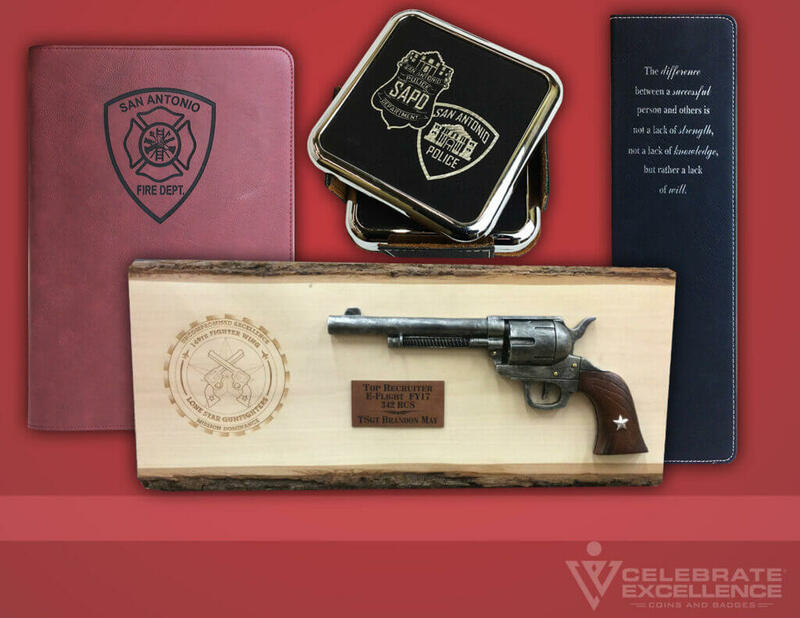 Our Gun Plaques are mounted on slabs of genuine wood, include a replica of a firearm, and have engravable leather plates. Other engravable leather goods include coasters, business card holders, pens (with engravable wooden, velvet-lined cases), bottle openers, magnets, name badges, pocket notebooks (with pen included), portfolio cases, journals, and wine bottle totes. We also have engravable wooden wine boxes, either black leather, or with rosewood finish. The foam insert of the wine boxes can be cut to allow a number of accessories to be embedded, such as wine openers. These wine boxes make for sophisticated gifts, either in the office, or for loved ones. For more creative gift ideas, consider an engraved enamel cups, tumblers, and wine glasses, which come with clear spill-resistant travel lids. Celebrate Excellence also carries awards medallions, which can be hung from a ribbon color of your choosing. They come in gold and silver, shiny or antiqued, and can be screen printed with custom images and messages, such as your company logo, a name, or congratulations. These simple awards pair well with trophies, and can be worn with pride by anyone.